Fashion as Photograph: Viewing and Reviewing Images of Fashion seeks to critically develop our perception and historical knowledge of fashion photography as an art form. Each chapter is diverse and engages in a critical debate about the use, interpretation and meaning of photography in the context of fashion. The book provides an overview of various pioneering photographers in the past and present day and illuminates iconic moments in the history of fashion and photography. 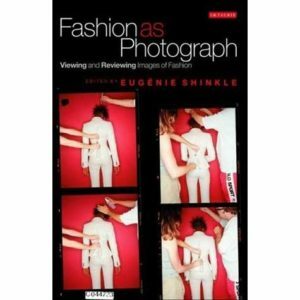 It documents the revolutionary evolution of artistic and commercial fashion photography and the innovative photographic techniques, styles and debates surrounding their display and production. Chapter 14 entitled ‘The Elegance of the Everyday: Nobodies in Contemporary Fashion Photography’ (p.200) explores the changing perception of beauty by looking at photographers who altered the style of fashion photography, by using ordinary locations, second-hand clothing and unconventional looking models. The lively compilation of text and the carefully selected photographs of influence showcase new innovations and technical advances that occurred in the 1990s. This chapter and its collection of images challenges the stereotypical ideals of fashion and glamour: the emphasis is not on perfection, it is centred on the ordinary and imperfection as an ideal. They offer a harder, more realistic take on fashion photography. The pictures are inspirational and honest in so much as they are not digitally constructed or enhanced unlike the conventional portrayal of a perfect beauty. They embrace the notion of imperfect beauty and market it as the ideal. British photographer Corinne Day featured non-professional models who were often friends or family members in her fashion editorials and her autobiographical work. This chapter examines Corinne Day’s most recognisable work ‘The 3rd Summer of Love’ which was an eight page black and white editorial featuring Kate Moss in a 1990 issue of The Face magazine. Day’s images launched the then-teenaged Moss’s career and changed the face of fashion. In the shoot, Kate embodies the girl next door image – a lively, free-spirited girlish innocence. The images offered realistic, obtainable fashion to its target audience thus promoting the ordinary as the ideal. This was in stark contrast to other fashion photography which nearly always evoked a world of glamour in exotic locations, epitomising an unobtainable lifestyle. Day’s editorial promoted a naturalistic style of fashion photography. The photos captured a natural, raw beauty and were not the typically stylised ones that were popular at that time. They did not seek to improve or enhance what was already beautiful, but simply embraced the notion of an imperfect beauty. In conclusion this chapter comments on the flexibility of fashion and how it adapts and shifts with the times. The central premise is that there has never been one recognisable notion of beauty; there are just various views and debates surrounding what constitutes as beautiful.